From the beginning of the project in January 2017, 27 people have already returned to Poland and other CEE countries, aiming to start the addiction treatment in rehabilitation centers and reestablish the contact with their families. BARKA IS keeps on helping others! 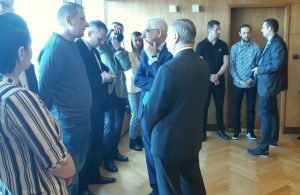 Last Saturday, 7th of April 2019, Polish Minister of Foreign Affairs, Jacek Czaputowicz, met Polish immigrants in Iceland. Tomasz Flinik, representative of BARKA IS, talked about help provided to polish citizens in the difficult life situations by our organization in the capital area. The meeting took place in the Polish Embassy in Reykjavik. 20 people have already returned home!